So I haven’t posted this week, sorry to everyone following! KF team had a well earned break, well everyone except me! calm before the next storm on the late summer weddings and lead up to Christmas! I’ve been viewing new venues, Dan has been cooking up new exciting menus, we intend to make 2014 a year to remember! Thankyou to everyone involved, our great team, our followers, and especially our clients, who not only give us great feedback, but continue to book with us throughout their lives! And lastly our venues who believe in us and continue to recommend us, thank you. So coming up in the next few weeks, new menus, venues and fab ideas for our lovely couples who we are so excited for in 2014, and so pleased that they chose us to be a part if their special day! Honey glazed Chicken Skewer anyone? Our not so smiley chefs!! Concentrating to get it just right! Well done guys, looks delicious! Our lovely smily Rosie, Ben & Charley, all ready for arrival drinks reception! Brook Farm in the rain! 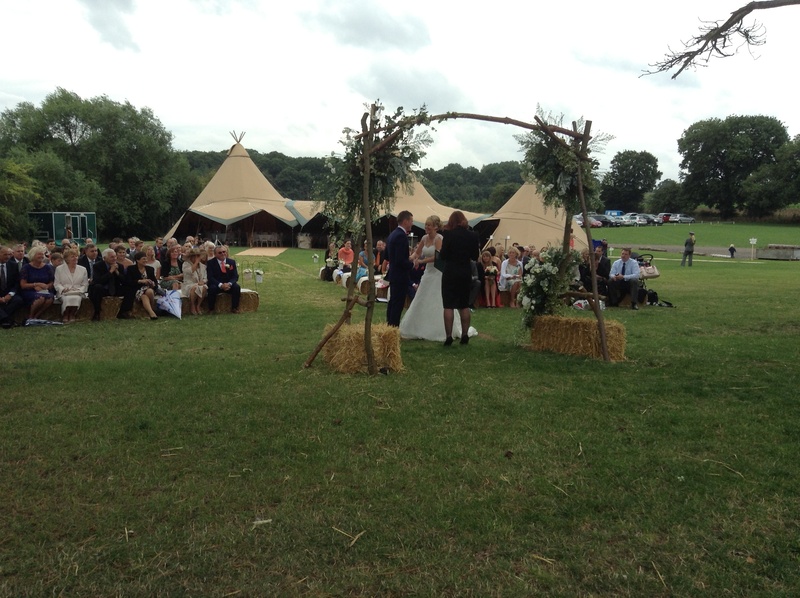 So Saturday saw us back at Brook Farm for Luke & Helen’s wedding, ceremony took place over looking the lake out the front of the Tipis, beautiful apart from the fact the threatening rain started just as Helen made her way from the car. 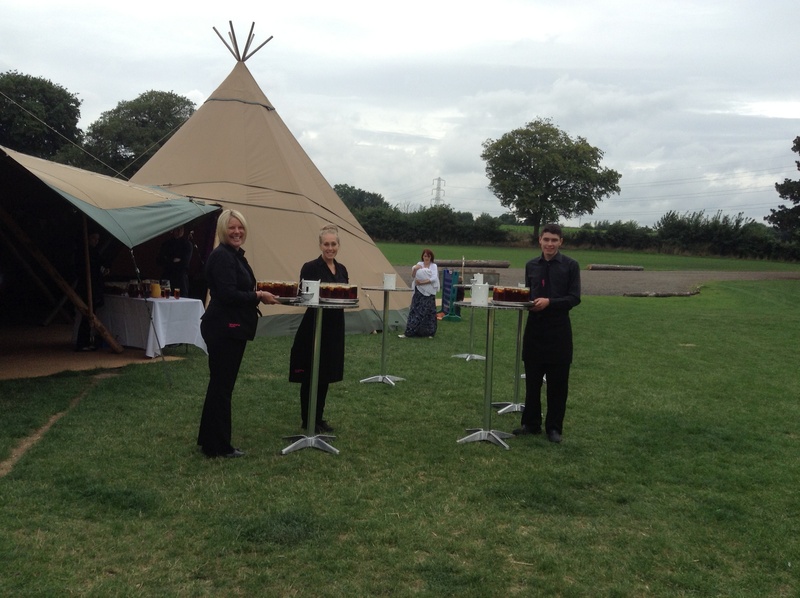 KF team quickly lifted all the laid tables carefully to the back of the Tipis to accommodate the 120 guests should the ceremony have to be moved. Luckily the rain was only slight so they managed it all outdoors! 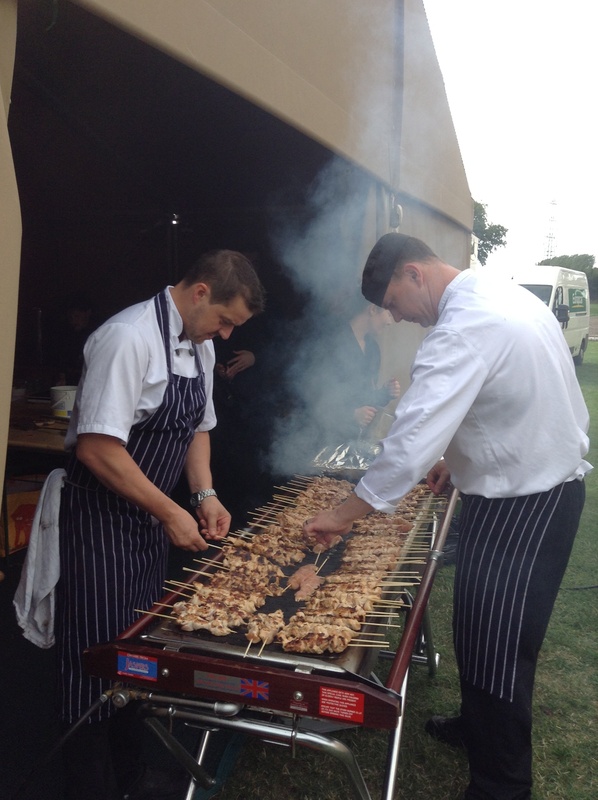 The wind and the rain soon picked up, John & Stuart did a great job barbecuing 500 skewers half in the catering tent! They cooked Beef and Stilton Burgers, Honey glazed Chicken Skewers, Haloumi and Vegetable Kebabs and Lamb Koftes, served with a selection of potatoes and salads. Delicious! Luke & Helen’s family and friends were lovely fun people, they partied from the start and drank hard from the bar, which was never less than 3 deep all evening! Well done to Ian, Rosie and Joel who kept it under control! The rain didn’t stop, but no one cared, great night had by all, a pleasure for us to be involved. At least we only got wet from the rain this week, last week Ian insisted on showering under the beer keg!! Bowl food from Saturdays event, great ways to have lots of different flavours, rather than just one choice!